When two of New Story’s four co-founders took a mission trip to Haiti in 2013, they were shocked to find how many families were still living in tents after the devastating 2010 earthquake. What was supposed to be a temporary shelter built to last six months had turned into the new standard of living for countless families. 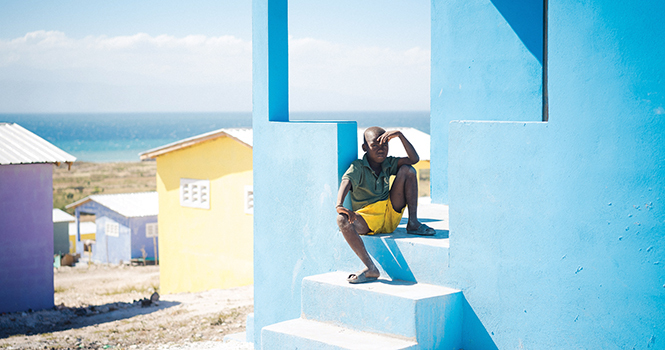 In 2015, Brett Hagler, Mike Arrieta, Alexandria Lafci and Matthew Marshall launched New Story, a non-profit “working to create a world where no human being lives in survival mode.” Since its inception, the organization has funded the building of more than 1,300 homes for more than 5,000 people in Haiti, El Salvador and Bolivia. But New Story’s efforts to enlist local partnership is paying off in more than just roofs over heads. Through surveys conducted with families before they move into their newly built home and then three, six and nine months afterwards, New Story is seeing an impact on the entire community, in terms of increased incomes, better education and access to medical care. “Because we involve local partners, the impact is far greater than just a home,” says Lee. While there are certainly housing needs around the globe, New Story’s goal is not to be in as many countries as possible, but rather, to go deep in critical areas. The organization also works with its local partners to develop a process for determining who will receive a New Story home. In Haiti’s tent community, for example, families participated in surveys to see if they qualified for a home (to make sure, for example, that they did not have an alternative housing option), and then entered a lottery system. In El Salvador, however, members of the community came together to determine which families had the greatest need. New Story also realizes that to make a larger impact, they will need to go beyond their individual efforts. “There are hundreds of millions of people living in survival mode,” says Lee. “We’re not naïve enough to think that over the next 10 years, that we as a nine-person organization are even going to put a dent in that number. The biggest thing we are looking to do in the future is constantly be practitioners of this work, and also develop technology and platforms that will help other organizations do the same thing in other countries. And perhaps real estate agents understand the impact of New Story’s work better than anyone else. “To be able to use their work and income to provide the power of a home to families that otherwise would never have the opportunity is a really cool tie-in to what they’re dedicating their lives to,” says Lee. For more information, please visit www.newstorycharity.org.